Where it is located: Little Village is a neighborhood in the South Lawndale Community Area. It is marked by number 3 on the Walk Location Map. 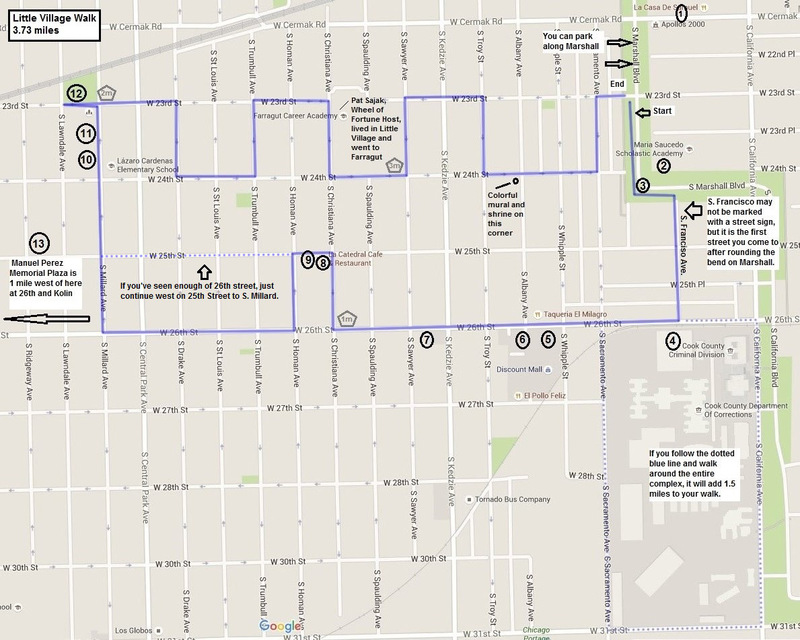 Comments from Marge: This is one of the most unique walks you will take in Chicago. When most hear of the location “26th and California” thoughts instantly go to the large Cook County Criminal Courthouse and crime. South Lawndale’s violent and property crime is lower than where I live, in the Near North community area. In addition, Little Village is a featured neighborhood on the Chicago Tourism website “Choose Chicago” , the official destination marketing organization for Chicago. With that out of the way (and you can always check the latest crime stats at the Chicago Trib), I hope you will make it a point to visit here. Little Village is truly authentic in its Mexican ethnicity. Hipsters, art galleries and trendy restaurants have not yet invaded the neighborhood. Storefronts display pinatas and quinceanera dresses, homes have shrines in their front yards and murals adorn many building facades. 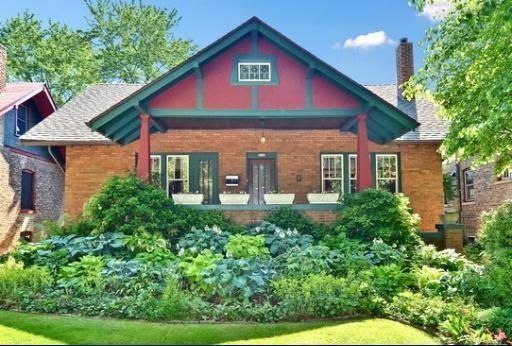 Remnants of the area’s history before Mexican immigrants started arriving in the 80’s can be seen in a Prairie style field house or the homes of former famous residents, Anton Cermak (former mayor of Chicago) and John Shedd (for whom Shedd Aquarium is named). One of the most interesting aspects of this neighborhood is the imposing Cook County Criminal Courthouse and Jail. On one visit, we took a wrong turn and ended up walking around the entire complex. It left an impression! That is another very unique opportunity this walk can provide if you want to take the time. Comments from Ed: I call this walk one of our Deep Tracks. Like an overlooked song on a hit record album, this area is misleading. Only by walking these streets can you connect with the vitality of Chicago life today. When you walk 26th street you are more in Mexico than America. It is a safe and stimulating area for the curious and open minded. The justice complex at 26th and California is the scene of millions of criminal justice dramas. Due its function, it, too, is very safe. Stand across the street and see humanity struggle with crime, poverty, and disadvantage. It is hard to remain unchanged. There is also rich Chicago history on this walk. For a Chicago native or die-hard urban explorer, this may be your favorite walk. It’s one of ours. 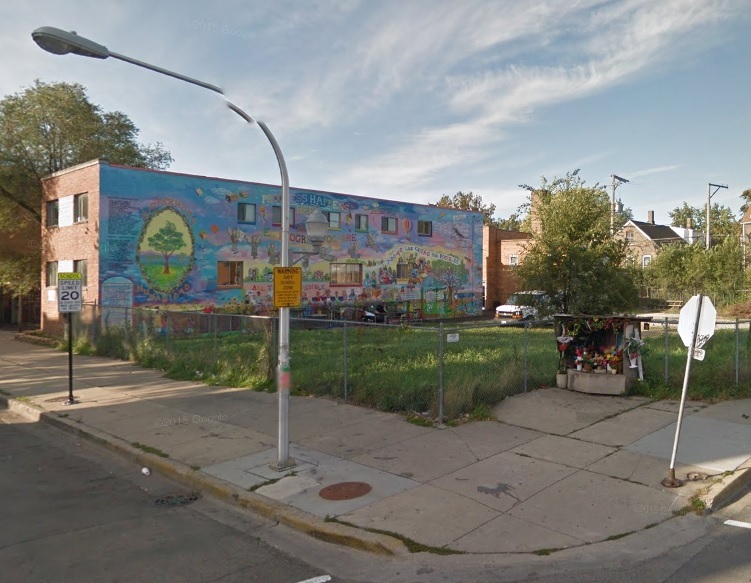 Little Village is a neighborhood centered on 26th St. in the South Lawndale Community Area. It is predominantly populated by Mexican Americans and new Mexican immigrants to Chicago. It was originally settled by Irish and Eastern European immigrants in the late 19th century, after the Great Chicago Fire sent the population of Chicago rippling out from the city’s center to the outlying countryside. Jobs created by industrial development in the early 20th century also attracted residents to the Little Village area, adding to the community’s strength and viability as its own independent borough. By the mid-20th century, Little Village saw a marked increase in Polish immigrants escaping the ravages of war-torn Europe, and in the ’80s a large influx of Mexicans moved to the neighborhood. Many of these new residents were transplants from neighboring Pilsen. They were displaced during the construction of the University of Illinois Chicago campus, which chewed up a large section of residential land, pushing inhabitants further west from downtown. But it is the injection of Latino culture that gives the Little Village neighborhood its vibrant and distinct character today. In fact, the neighborhood is called “Mexico of the Midwest” by many of its residents. 1.) Drive by 2875 W. Cermak, Apollo’s 2000 on the way to park on Marshall Blvd. This art deco building was originally the Marshall Square Theater, opened in 1917 as a vaudeville venue, later a silent movie theater, and currently a venue of banquets, weddings, and Latin music under the name Apollo’s 2000. Note the tragic placement of the strut for the Apollo’s sign right through the face of the beautiful terra cotta goddess above the main entrance. Park your car on Marshall Blvd. near 23rd street or Maria Saucedo Scholastic Academy. Walk south on the sidewalk and you will see #2, Maria Saucedo on the East side of Marshall and #3, the Marquette & Joliet statue in the grassy area at the curve on the west side of Marshall Blvd. Formerly the Carter Harrison High School, this massive school is now an elementary school, named for Maria Saucedo, an area teacher who died in a fire in 1981. Carter was the alma mater of clarinet player Benny Goodman and newspaper columnist Irv Kupcinet. Herman Atkins MacNeil completed this sculpture of Marquette and Joliet in 1926 under a commission from the Benjamin Franklin Ferguson Monument Fund. Benjamin, a Chicago lumber baron, left a million dollars in his will of 1905 for the purpose of erecting and maintaining enduring statuary and monuments along the boulevards or in other public places. Between 1905 and 1931 the Fund placed 10 sculptures throughout various parks and beltways of Chicago. Round the bend on the sidewalk, and the first street you come to after the bend in Marshall, is S. Francisco Ave. It may not be marked with a street sign. Go south on the sidewalk along S. Francisco Ave to get to 26th Street. The Cook County Department of Corrections (CCDOC) is one of the largest (96 acres) single site county pre-detention facilities in the United States. Primarily holding pre-trial detainees, the Department admits approximately roughly 100,000 detainees annually and averages a daily population of 9,000. It was located here due to the clout of the neighborhood’s famous citizen, Anton Cermak: businessman, political boss and mayor of Chicago. A suggested addition to this tour would be to walk completely around this complex. The enormity of the place, the barbed wire, the guard towers and the tiny windows are foreboding and chilling. It will leave an impression. 6.) 26th and Albany, Terracotta Arch over 26th St. 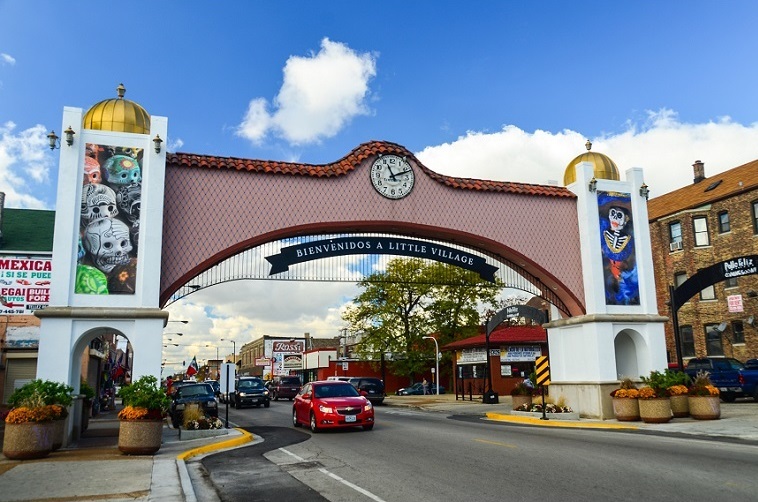 This arch welcomes you to Little Village. The clock in the arch was given by the Mexican government in a visit by Mexico’s president in 1991, but has only worked intermittently in the years since then. It has been repaired, only to break again. Whether to repair it or get rid of it is a subject of controversy. You might be surprised to know that this 2 mile stretch of 26th street is second only to Michigan Avenue as the highest grossing shopping district in the city. Family owned bakeries, restaurants, clothing stores, grocery stores, and barbershops give the Mexican American residents the food, clothing and household goods of a country they left behind. On the weekends there is an influx of Hispanics from suburbia and the entire Midwest shopping for goods that remind them of home. Take a leisurely stroll and take in sights that you will see in few places outside of Mexico. The décor is religious artifacts and worth a look see. The restaurant is very popular. We were there on a Sunday around lunch and it was interesting to see all the young couples waiting for a table for brunch. It could have been Wicker Park or Logan Square! This restaurant is connected to La Catedral, but its entrance is on 25th Street. The chef is the same for both restaurants. If La Catedral is packed, you can find a table here and enjoy a wide range of quesadillas. Anton Cermak, businessman, party boss and mayor of Chicago from 1931 – 1933, lived here from 1923 until his death in 1933. The home was put on the National Register of Historic Places in 2011. He was Chicago’s only foreign born mayor, born in Austria-Hungary (now the Czech Republic) in 1873. On February 15, 1933, Cermak was in Miami with FDR on a presidential campaign trip and was shot by a bullet intended for FDR. The mayor lingered for 20 days before dying. The story goes that Cermak told FDR in the hospital, “I’m glad it was me instead of you”. 22nd Street was named Cermak Road after his death. Cermak lived in this neighborhood from the time he was 19 and had strong ties to the then largely Bohemian neighborhood. When his body was returned to Chicago, it stayed in this home for visitation the day before his funeral. On a freezing winter night, hundreds of neighborhood people lined up in the cold to see him one last time. Cermak is buried in the Bohemian National Cemetery in Chicago. One last interesting fact is that his son in law was Otto Kerner, Jr., the governor of Illinois from 1960 – 1968, who was subsequently jailed for a couple of years after a bribery scandal. This Queen Anne home that John Shedd built and lived in from 1888-1906 is remarkably intact, retaining its original porch with simple turned columns. Shedd moved to a 22 room Gothic mansion in Kenwood after living here. Shedd (1850 – 1926) was the second president and chairman of the board of Marshall Field & Company. Under Shedd’s presidency, Marshall Field’s became the largest store in Chicago and the largest wholesale and dry goods company in the world. Although he donated $3 million to start the Shedd Aquarium in the early 1920s, he never saw it built, as it opened in 1930, 4 years after he died. Fieldhouses like the Shedd Park Fieldhouse were built to serve as the centers of recreational activities in the City’s smaller parks in working-class neighborhoods. The original 1917 portion of the fieldhouse was designed in the Prairie style by William Eugene Drummond, a protégée of Frank Lloyd Wright and one of the City’s most skilled designers in the Prairie tradition. The building’s rear gymnasium addition, also designed in the Prairie style in 1928, was the work of the architectural firm of Michaelsen and Rognstad who produced a variety of excellent historically inspired designs in Chicago, including large fieldhouses for Humboldt, Garfield and Douglas Parks. The fieldhouse was named for Chicago entrepreneur and philanthropist John G. Shedd, who donated the land for the surrounding park which also bears his name. This fieldhouse is a Chicago Historical Landmark. On the way back to your car, meander up and down the residential streets off 23rd to get a feel for the way people live in the neighborhood. You will see some interesting landscaping as well as some religious shrines in their yards. There are murals sprinkled on buildings around the neighborhood. If you’d like to see one last sight before leaving, drive west down 26th Street to The Manuel Perez Memorial Plaza, a small park featuring murals and mosaics honoring Manuel Perez Jr., who was posthumously awarded the Congressional Medal of Honor for his actions in the Battle of Luzo, Phillipine Islands in February, 1945, a month before he was killed in action. Comments from Marge: This walk has it all! Homes dating back to the 1800s, diverse architecture, murals, National and Chicago Historical Landmarks, the best barbecue in Chicago, and a sense of place carefully preserved by the community and its many neighborhood associations. My favorite stop on the walk is the Villa District, the absolute cutest and smallest neighborhood in Chicago. Tucked away in the most unlikely location, you will find craftsman and bungalow style homes from the early 1900s, boulevard streets with landscaped medians and distinctive stone planters marking the place. Comments from Ed: Marge has said it all; almost. With this walk you can observe, more than anywhere else in the City, the gash that the expressway made when it was built. Walk the underpasses and then hear the traffic as you walk these idyllic streets and you can feel the anguish that the residents felt, when they dealt with this assault. The neighborhood gives new meaning to the term Not In My Backyard. Irving Park’s development began in 1869 when 4 New Yorkers purchased farmland in what is now the Old Irving Park neighborhood. They originally intended to farm, but after seeing the success of the suburban communities sprouting around them, decided to subdivide the land and create an exclusive settlement 7 miles from the city. The original name chosen for the new community was “Irvington” after the author Washington Irving. As the name was already taken by another town in Illinois, the name of Irving Park was adopted. Mansions and grand homes built in a variety of architectural styles gave way to less pretentious homes after the influx of residents after the Chicago Fire. This walk will take you through neighborhoods with homes built in the Victorian, Foursquare, Revival, Craftsman and Bungalow style. It will take you by the oldest home left in Irving Park, built in 1856 as well as the beautifully restored Carl Schurz high school, known for its prairie architecture. Irving Park suffered during the Depression and its post WWII prosperity was diminished by the announcement that the Northwest Expressway (now the Kennedy) would cut right through the heart of the community. Today, many young families and professionals call Irving Park home as they discover its rich architectural history and heritage. Preservation efforts are ongoing through home restorations and the efforts of the Irving Park Historical Society. 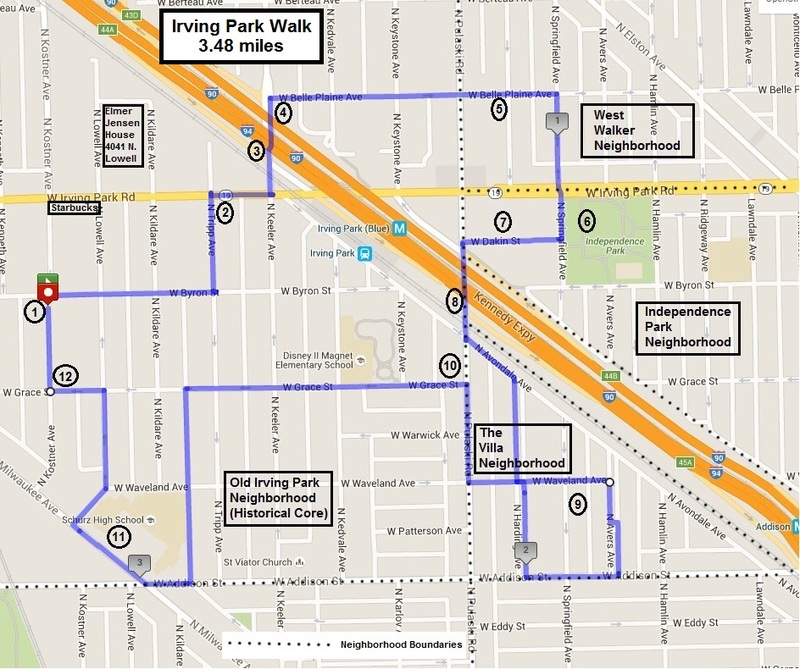 The Irving Park Community Area consists of 8 neighborhoods. You will walk through 4 of them on this tour: Old Irving Park (the historical core), West Walker, Independence Park and the Villa. 1.) 3854 N. Kostner Ave.
Home of John and Clara Merchant. It was approved as a Chicago Landmark in 2008 and much of the content below is from the Landmark Designation Report. The John and Clara Merchant House, built ca. 1872 from a pattern in Woodward’s National Architect (1869), is a handsome Second Empire-style building near the corner of Kostner and Byron avenues. Its large mansard roof and carved flat-lintel window hoods exemplifies the style and visual character of the large single-family homes that dotted the Grayland settlement in the 1860s and 70s. Clara was the daughter of John Gray, one of the original owners of the farms that were the basis for the Irving Park Neighborhood. John and Clara Merchant and their seven children lived in the house until about 1879 before moving to Russell, Kansas. They put the house in a trust, but returned in 1886, presumably because Clara’s mother (Phoebe Gray) had died. Upon their return, the Merchants began holding religious services in the house, and in 1886 formed the First Baptist Church (later called Irving Park Baptist Church). John Merchant died in the house in 1913 and Clara Merchant, who had later moved from the house, died in 1927. The Merchant House is an exceptional example of the Second Empire style. It is named after the reign of French emperor Napoleon III (1852-1870), commonly called the “Second Empire,” and is based on a nineteenth-century reinterpretation of seventeenth-century French Baroque architecture. In America, the Second Empire style was seen as a prestigious and stylish European architectural style, worthy of emulation by wealthy American clients with a hunger for European chic. Introduced in the U.S. in the 1850s, the style was especially popular for stylish single-family houses in the 1860s and 70s. This home is significant in the history of Chicago and the neighborhood of Irving Park. 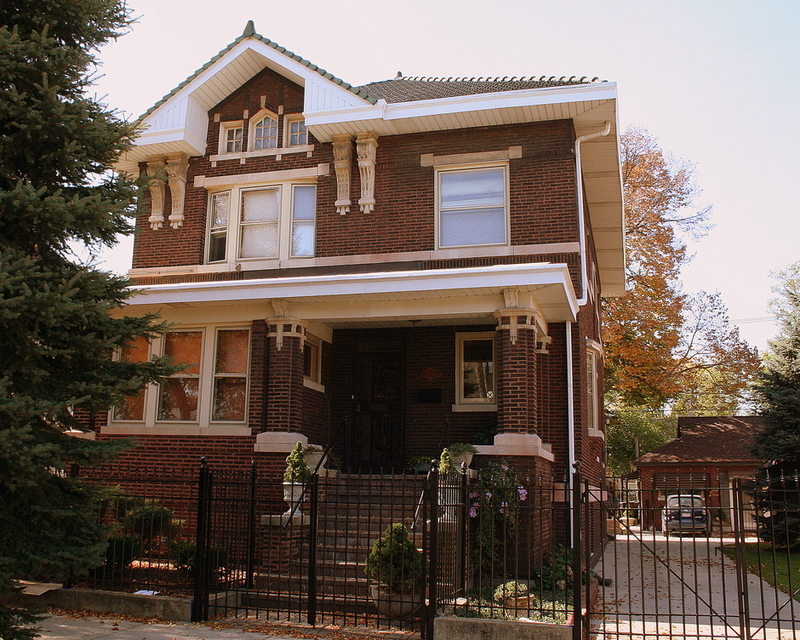 It is the only remaining home of the original founders of Irving Park – the Race family. The Stephen A. Race house is a rare Chicago example of a red brick Italianate structure with its architectural integrity for the most part still intact. Originally sited on Irving Park Boulevard, a road that was once an Indian trail in early Illinois, the home’s style is especially representative of the type of grand residential dwellings that once lined Irving Park Boulevard in the mid- to late-nineteenth century, when Irving Park was a suburban/country retreat. When originally built, the home cost $12,000 – a significant amount of money in 1873. The Charles T. Race House, which no longer exists, was slightly grander in scale and cost $15,000. Both homes were of the Italianate style, one of the most popular architectural styles between 1850 and 1880. While the architect’s name is unknown to us today, the similarities of the Race homes indicate the brothers used the same architect. Four stories high, the Stephen A. Race House is composed of red brick contrasted with white limestone and painted wood trim; its style is derived from the villas of Tuscany in Northern Italy, which are characterized by a symmetrical box shape capped by a flat roof. Large eave brackets dominate the cornice line of Italianate houses. On the Race House, these are over-scaled, elaborately scrolled and arranged in pairs – typical of this era and style. Particularly arresting is the treatment of the windows on the second level. Tall and thin, with two-over-two lights, they are emphatically framed with semi-circular arches stamped by a prominent limestone keystone. At Irving Park Road at the Metra underpass bounded by the Kennedy Expressway exit and Keeler on the north wall and the Kennedy Expressway entrance and Avondale on the south wall. Created for the Old Irving Park Association, the base concept of the Positive Babel mural is the world lives, works and plays in Old Irving Park. There are 70 landmarks and iconic structures from various nations throughout the world represented in the mural. The blue in the sky of the mural was selected to represent the color of the Chicago flag. 4.) 4053 N. Keeler Ave.
You will pass through the corner of this neighborhood, characterized by large single family homes in late Victorian, Foursquare and Revival styles. The Independence Park Neighborhood was established in the 1800s, and it retains the vintage character of oversize lots, mature trees and generously sized homes in a variety of period styles. Independence Park itself was established in 1914. The attractive brick fieldhouse was designed by Hatzfeld and Knox. Independence Park was once considered the best landscaped park in the city, but it is now mostly a bland assortment of ball fields and playgrounds. The park was named to the National Register of Historic Places in 2009. The area south of Irving Park Road was developed by Samuel Gross and was known as “Gross Boulevard addition to Irving Park”. The housing stock is similar to that of West Walker. This mural depicts the advertising that the original Irving Park Developers used to entice people to move there. This is the highlight of the tour for me! This cute little neighborhood was dubbed the “Polish Kenilworth” by Mike Royko, a famous Chicago newspaper columnist. It is a Chicago Historical Landmark District. Developed in the early 1900s, its hallmark characteristics are the craftsman and bungalow style houses on boulevard style streets with landscaped medians. Stone planters mark the area. Smoque is at the corner of Grace and Pulaski. It is a very famous barbecue place with many awards and write ups. If you are really determined to eat here, you will have to be very patient. The line sometimes wraps around the building. 11.) Schurz High School 3601 N. Milwaukee Ave.
Gray’s first home built in 1856 at 4362 W. Grace survives today in a remarkable state of preservation and is the oldest house in Irving Park. John Gray was the owner of the farm which was bought by the 4 New York men to develop what is now known as Irving Park.